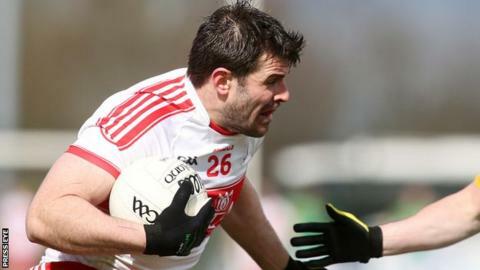 Derry and Fermanagh both salvaged late draws to boost their hopes of avoiding relegation from Division Two. Cavan enhanced their promotion prospects with a comfortable 1-17 to 0-15 home win over Laois and will go up to Division One if they beat Galway next Sunday. An injury-time free from Ryan Bell gave Derry a 2-12 to 2-12 draw with Meath. Declan McCusker rescued a valuable point for 14-man Fermanagh who drew 0-15 apiece with Galway in Tuam. Pete McGrath's side host Tyrone in next Sunday's final round of fixtures still needing something from the game, with the games between Armagh v Derry and Laois v Meath also crucial in determining who falls through the trap door into Division Three. Derry had a terrific battle with Meath at Owenbeg, Mickey Newman's 10th minute goal giving the Royals an early advantage but Derry hit back with a Danny Heavron goal on the half hour mark. Cillian O'Sullivan gave Meath a second major of the half and they led 2-4 to 1-6 at the break. Niall Loughlin's 41st minute goal put Derry back in front and Damian Barton's side hit four points in a row with Christopher Bradley and Benny Heron among the scorers. They led by 2-11 to 2-7 with 10 minutes remaining before Meath rallied with five unanswered points. Andrew Tormey thought he'd hit the winner for the visitors before Bell eased Derry's nerves a crucial injury-time free to draw the game. There was also a dramatic finish for Fermanagh, who hit the last two scores through Tomas Corrigan (free) and McCusker to rescue a valuable league point in Tuam. Promotion hopefuls Galway led 0-7 to 0-6 at half time and Fermanagh's challenge looked doomed when Niall Cassidy received a red card in the 41st minute. Galway still led by two points as the game entered stoppage time with Fermanagh's late heroics leaving them on five points, one ahead of Armagh and Meath and two ahead of Laois. The draw didn't dent Galway's promotion chances as they still face a winner-takes-all promotion shoot-out with Cavan at Breffni Park on 3 April. Seanie Johnston's 14th minute goal helped Cavan lead by 1-9 to 0-8 at half time against Laois and they led from start to finish for a comfortable five-point win. Gearoid McKiernan kicked 0-3 from play with Johnston top-scoring with 1-3.